I own two pairs of footwear that would be considered ‘proper’ shoes, and that’s only if you count the Lara Croft replica boots. However I do own a lot of sports shoes (especially if you count the two pairs of fins, but let’s not go there). My current collection includes three pairs of cycling shoes (road, tri and offroad) and five pairs of running shoes. The latter is excessive, I admit. But, you see, there’s the old pair of Asics I’ve had for about ten years and they’ve been retired from both racing and training but they’re still good for general purpose wear. There’s the old pair of Trabucos that I’ve trained and raced in to the point where the orange has turned muddy and the uppers are wearing through. There’s the new pair of Trabucos that I bought to replace them but they don’t fit as well because they changed the last and put a stone-plate in there. There’s the pair of Inov8s I use for lightweight hiking and will be used for running if I ever remain injury-free for long enough to get out into the hills. And there’s the pair of Salomons. I bought these from Run4It on Lothian Road, to replace the Trabucos with the stone-plate when it became clear that no amount of use was going to break them in to the point where they were comfortable. Back in my competitive ski-ing days I used to wear Salomons and I have a pair of Salomon walking boots, as well as a Salomon Raid Revo running pack and some of their running tights. I like their stuff. It’s usually built well and thoughtfully and suits my needs. In the shop there was a slight niggle in my left foot, but that was the one that had been playing up with the Trabucos, so I figured that it was just bruising. On the treadmill they felt fine. I ran 20k in them on the treadmill in the gym just to be sure. With some lace adjustments and the right socks they seemed okay when I finally took them outdoors. For about 100k. Then the pain started. Excruciating. It felt like I was landing on a spike every time my left foot went down. 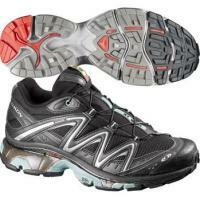 Eventually I took them back to the shop and they sent them off to Salomon. Salomon said they’d found a slight flaw and sent me a new pair. I was even more careful. I checked them in the shop. I checked them at home. I checked them in the gym. No niggle. They felt great. They felt like I had hoped they would feel. For about 30k. Then exactly the same problem. It was, oddly, relieved either by removing my socks completely —although I ended up with the interior seams chewing the tops of my toes, so I had to race my first of the season with my feet decorated in compeed— or thick off-road socks. Nothing in-between. During this time I developed acute ITB syndrome in my left knee. This cost me a couple of hundred quid in physio, three months off training and racing at Tranent. My second race of the year, in April, ruptured the plantar fascia in my right foot, which was probably compensating for the restricted motion in my left leg. More physio, not to mention podiatry charges, and more time off training (I managed 15 minutes on the treadmill yesterday and have spent most of the last 3 weeks with my foot taped). After analysing the various factors that could have contributed, I can only come up with one thing: the shoes. I’m a mid-foot striker, landing just behind the ball of my foot. What this means is that most trainers are ill-suited to my gait. They have too much padding in the heel and not enough at the front. I’m also a mild over-pronator, so I need late-stage motion control. These are things that competent staff at a good running shop should know about and it’s why I go to a specialist running shop instead of buying my shoes for half the price over the internet. I value the additional service of knowledgeable staff. I shouldn’t have been sold these shoes. It’s not that the shoes are bad shoes: they’re just not suited to my style of running. Unlike the Asics, which have the built-up heel but also have a fairly generous amount of forefoot padding, the Wings save weight by reducing the padding at the front. This means that, not only is there insufficient padding to protect the foot at impact, the heel is about 50% thicker than the forefoot. In a mid-foot striker this limits ankle flexion through the stride, putting undue strain on the calves and the windlass mechanism in the foot. Because of the lack of padding in the front, eventual compression of the insole meant that when the ball of my foot landed on one of the knurls in the sole I could really feel it. I’ve had to find out all this for myself by careful research and a lot of reading, which I’ve had time to do because I CAN’T BLOODY TRAIN DUE TO THIS STUPID INJURY. I’m a bit grumpy from lack of exercise. There have been suggestions recently that barefoot running techniques, including non-heel striking, increase the chances of plantar fasciitis. I’ve been running this way for five years now and this year is the first of me having an injury of this nature. While it’s true that barefoot running isn’t for everyone, because everyone is different and biomechanics are not generic enough for one technique to suit all, I can’t accept that my running style has caused this injury when I’ve been fine with it for a number of years and thousands of kilometres. I think the problem is more that most shoes aren’t designed for these techniques, and mixing the two is what is causing the problems. If you’ve got a runner who has heard about these techniques and decides to give them a go in his ordinary running shoes, and those shoes are designed for heel-strikers, then he’s going to suffer the same issues as me: the shoes promote a heel-toe movement and he’s running with a toe-heel movement. Seems fairly obvious to me that this is not a good thing. Although Run4It has the best selection of Hilly socks in Edinburgh, I’m not best pleased about the service I’ve received there and won’t be going back. I did go in and explain the situation, however their response was to thank me for letting them know and say they’d make a note of the feedback for future customers. That didn’t help me at all. I’m trying to look on the bright side: I am now far more knowledgeable about shoes, feet and running than I ever was before and am in a better position to assess whether the staff in a shop are able to offer me competent advice or not. I have finally found a good reason to spend the money getting a biomechanical assessment from a podiatrist and have external verification that my obsession with technique and stretching has paid off. However, the shoes cost me the best part of 90 poorly molluscs, the combined physio and podiatry costs are in the region of £350, I may need custom orthotics to stop this happening again because of the weakness in the foot; and I currently have only a very slim chance of being race fit for the Galway Triathlon, which wasn’t exactly pocket change to enter. And I still need to replace my trail shoes. At least I have a very good idea of what to avoid. I won’t be running in the Salomons again. Size UK 6.5, ladies, blue, have done about 50k and look brand new. Any takers? I don’t have the gene that codes for “wanting to keep a pair of shoes that don’t fit me properly and I’m never going to wear”. It put me off work for 3 years, and still limits me to 2 hour maximum moving on my feet at any one time, or 15 minutes standing time. I’ve been known to sit on the floor in the middle of queues because of the pain. And that’s on a good day. Admittedly a good doctor and early rehab with a towel could have reduced the scarring and chronic affects. Initial injuries were 8 years ago now and will be with me for life.